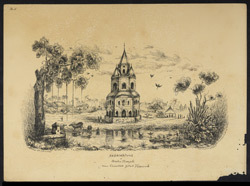 Pen and ink drawing by Frederic Peter Layard (1818-1891) from an earlier sketch of 18th February 1839, of a temple at Comilla in Bangladesh, dated 1843. The image is inscribed; 'Sattarahtond a Hindoo Temple near Comillah Zillah Typerah. Sketched 18th Febry 1839. F.P. Layard 19th B.N.I. Eld.(?) Feerozepoor, 21st Sept 1843'.